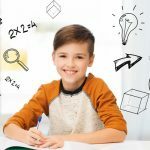 HomeCoursesMath Courses2-4-6-8: You Can Learn To Do Math Great! This course is designed for the student going into middle school math OR the middle school student who is struggling, needs extra practice or an alternative way of doing calculations. To build a strong foundation of math basics, you need to learn and practice. Various strategies such as virtual manipulatives, online games, classroom activities, video clips, music and the standard algorithms will be used in this course. All of these training methods will be implemented to teach computations with decimals, fractions, mixed numbers and percents. These skills are the building blocks needed to excel in higher level math classes. This class can be taken in conjunction with a traditional math class.